Bishkek, December 10, Interfax - The Church of the Holy Equal-to-the-Apostles Prince Vladimir, the biggest in the Central Asia, was consecrated and officially opened on Thursday, the local diocesan press service told Interfax. Head of the Central Asian Metropolitan District, Metropolitan Vikenty of Tashkent and Uzbekistan chaired the consecration. Hierarchs from Uzbekistan, Russia, Tajikistan and Turkmenia participated in the ceremony, officials from the presidential and governmental administration and diplomatic missions attended it. 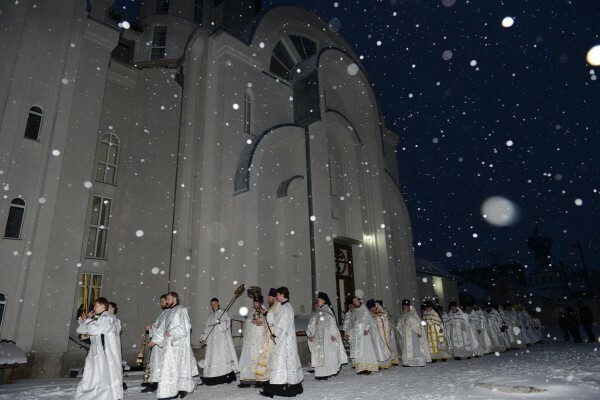 The consecration of the church was timed for the 1000-year commemoration of St. Vladimir – the Baptist of Russia, celebrated by the Russian Orthodox Church this year. The church can house up to 2,500 people, the height of the cathedral without the cross is 34 meters, the square totals to 1040 square meters. “As to its architectural design, the cathedral is the most grandiose church building in the republic,” the interviewee of the agency stressed. The new Orthodox church is located in the south of Bishkek, its building started in the mid-1990s.